As Bailli, I take great pleasure in welcoming you to our new Bailliage du Canada website. Through vehicles such as this site and our semi-annual newsletter, we hope to create a closer national Bailliage, while keeping you informed about events and activities locally, nationally and around the world. 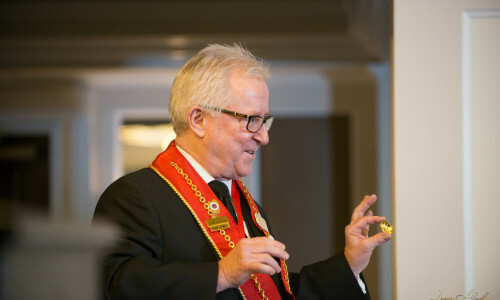 As members of this remarkable organization, we have a unique opportunity to meet regularly with others who enjoy everything that the Chaine has to offer: great cuisine, fine wines and most importantly of all, good fellowship. As we all know, the Chaine membership is a balance between our professional members, who create the culinary masterpieces, and our non-professional members, who enjoy the fruits of their labours. I encourage everyone to look over our directory of professional members on this site and in our magazine. Take time to visit our member establishments to sample the delights they prepare on a daily basis. Nowhere is our commitment to the culinary future more evident than in our support of future chefs. Through annual competitions on local, regional and national levels, culminating with our Canadian winner competing at the Concours International des Jeunes Commis Rôtisseurs, our support offers a unique opportunity for young chefs to hone their skills in a challenging atmosphere. In the end, both professional and non-professional members win. Please enjoy the site and take advantage of all the links to local, national and international Chaine de Rôtisseurs information sources. As always, your comments are welcome.